A light cream that sinks straight into the skin helping to hydrate dry parched skins. Apricot and Avocado oils help to hydrate, nourish and moisturise the skin. Whilst Borage oil gives parched skin a drink of water. Essential oils of Rose, Palmarosa, Frankincense and Patchouli help to improve elasticity and circulation. Also tones, tightens and stimulates the growth of new cells. Apply a pea-sized amount of cream morning and evening to cleansed, toned skin. Apply all over the face and neck avoiding the eye area. If any product comes into contact with the eyes, rinse with cool water immediately. Lovely moisturiser- silky smooth and smells wonderful. It is easily absorbed into skin but is very hydrating. Palmarosa and Patchouli moisturiser for Dry Skin is one of the best moisturisers I’ve ever tried. I love the scent. This product manages to soften the skin immediately. I love the feeling of my skin after I use it. The dryness is gone instantly, and my skin absorbs it well, so there’s no oily layer or residue. It’s perfect for daytime and nighttime use. I like the fabulous nourishing effect and this product is very easy for travelling as you only need to bring this, there’s no need to take multi step plans, extra moisturising night creams and other extras, this product will do the trick and it works very well. My skin looks radiant and refreshed. 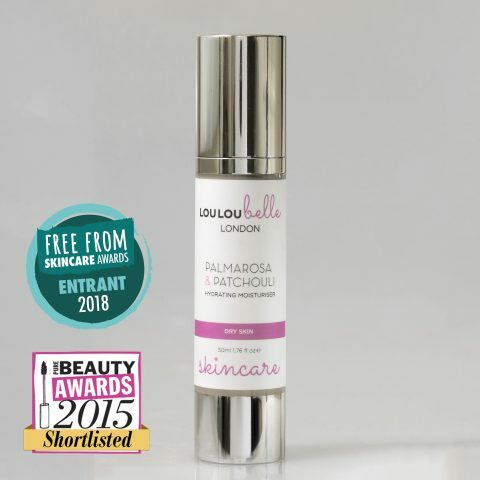 Palmarosa & Patchouli Hydrating Moisturiser is a beautiful product – it is lovely and light and absorbed straightaway into the skin, it really does hydrate and is totally non-greasy, unlike so many other products on the market – the scent is gorgeous and what I would describe as ‘generous’ as it doesn’t fade quickly!! !